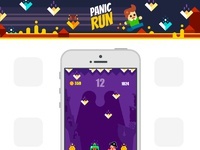 Run around panicking as obstacles fall from above to hit you! Your platform will move up and down making it easier or harder to avoid the obstacles as the game progresses! Collect coins to unlock beautiful backgrounds and characters. If you like it, please press "L" button.